In some ways, the story of this hat began back in October 2011. 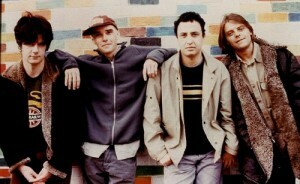 This was when The Stone Roses first announced they would be making a comeback. Even though the first official gig in this country would not be until June 2012, and I had a ticket for the date on 1 July 2012, like many people probably, I was already thinking about what I might wear, the band themselves being such fashion gurus. In that time, I asked a mate to design a patch for me, but this didn’t get made in time. I got a patch made myself, but only picked it up on the morning we were heading off to the gig, and didn’t get around to sewing it on my jacket. I had managed to buy some fairly wide trousers, but nowhere near as wide as I was hoping. I had thought about making a trip to Manchester at some stage to go clothes shopping but never got around to this. I bought quite an expensive t-shirt from Bank, but in the end, on the day of the gig, I just wore an old Stone Roses t-shirt, a battered old Reni hat and a denim jacket – hardly high fashion! (I did also make efforts to attend the very first official gig of the tour in Barcelona, but for reasons I shall keep to myself, I won’t go further into that episode). So anyway, what of this particular cap? Well, I’d always remembered that in the first photos of The Stone Roses when they made their “Second Coming” comeback, Ian Brown sported a baseball cap, and I’d always wanted to get one the same or similar. It had the word Browns on it, so I assumed it was a Cleveland Browns hat. Not sure if Ian Brown himself is a Cleveland Browns fan – I’m guessing he just got it because his name is Brown. Haha. A hat with your name on it! I could’ve tried the same stunt and perhaps got a New York Knicks hat, but in the end, I decided that would be a bit silly. People would not know that my name was Nick, and even if they did, putting 23 and 58 together, getting 81, and then realising that the reason I was wearing a New York Knicks hat was because Ian Brown had worn a Cleveland Browns hat would be just a little too complicated for most people I thought. At least if it was a Browns hat, some people at least, would get the reference I thought. It would be a bit different to a Reni hat, which everyone else would have. But as with everything else, I left trying to get this hat a little late – I didn’t get it in time for Barcelona, but I thought I’d have to try and get one for the Heaton Park gig. 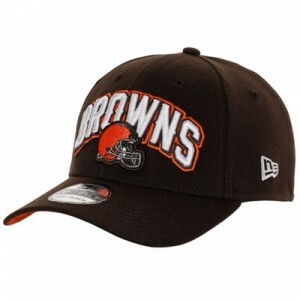 I looked around all the shops in Cardiff that sold NFL hats, but none of them stocked any Cleveland Browns merchandise. So I started looking online. Not even easy to buy the one I wanted on the internet in this country, either, it seemed. There were a couple of Cleveland Browns hats, but I had got it in my mind, it had to be a particular type, and most importantly, the word Browns had to be in a pale colour against a dark background, like the one Ian Brown had, not in orange, or another colour, as with some of them. There was one official hat which looked ok – the writing was white. It also had a picture of a NFL helmet on it, which Ian Brown’s didn’t have, but as it was the only one with Browns written in pale lettering, I had it in my head that it had to be this one. The only way I was going to get this particular hat, it seemed, was to buy it from an American shop and have it shipped over. The hat itself was not cheap, and most of the shops were charging ridiculously high shipping costs. I finally opted to buy it from the official NFL shop, which had the lowest shipping costs that I could find. I ordered it just 11 days before the gig, but I hoped that their promise of having it delivered within 7-10 days would also apply to this country and that I might have it to take to Manchester with me. Well, the day arrived, and no hat, so we took ourselves off to Manchester, and I had to make do with a Reni hat after all (still had a great time, see Post 44 for more on this. Didn’t see anyone wearing a Cleveland Browns hat though, to my disappointment, though not a big surprise, I have to say). I got back and from this point my “hat hell” began. I must have at some stage checked online to see the order status of the hat. A handy system, you might think. It appeared that some attempt at delivery had been made, perhaps while we were on our way to Manchester. But no card had been left, so I didn’t know if I was going to have to wait for a second delivery, or attempt to pick up the hat myself.